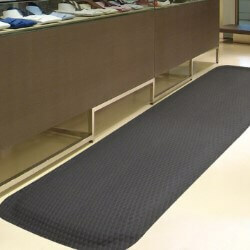 Electrically conductive mats are designed to drain the Electro Static charge from items placed on the mat. Mat should be grounded to be most effective. 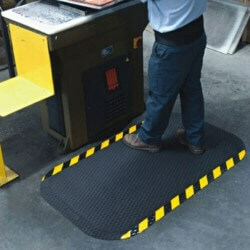 Electrically conductive mats are the quickest of ESD matting and have a surface resistance of less than 1 x 10 5 ohms/square. 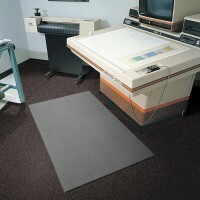 Must of conductive mats have anti-fatigue properties to provide workers comfort. 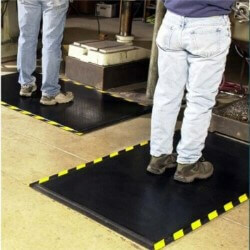 Happy Feet anti-fatigue mats are welding safe and chemical resistant. Available with OSHA color borders. An excellent anti-fatigue mat, the Hog Heaven Mat has a diamond textured surface and is available in either 5/8" or 7/8" thickness with solid or striped border. Chemical resistant mat. Constructed of solid Nitrile rubber, Hog Heaven is an excellent anti-fatigue mat, The Hog Heaven Mat has a diamond textured surface and is available in either 5/8" or 7/8" thickness with striped or plain border. 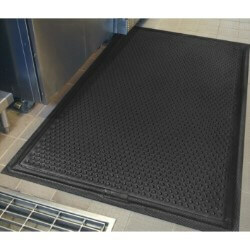 Chemical resistant mat.